Occasionally a kitten is born with a leg that appears twisted that is caused by contracted tendons. The leg is turned inward and the affected joint is stiff with a knotty feel. It can affect either front and hind legs and one or more legs. The condition is thought to be the result of poor positioning or crowding in the uterus. If treated within a few days following birth, in most cases, the condition can be corrected within just a few weeks. 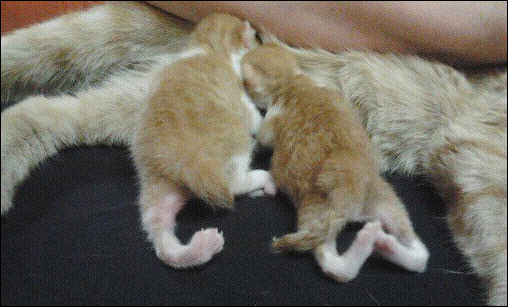 the articles Contracted Tendons and Photos Of Kittens Born With Twisted Legs. To correct the leg, initially you need to repeatedly push the twisted leg toward the normal position. By stretching the leg as far as it will go towards normal, the contracted tendon will gradually lengthen. Begin by warming and massaging the leg then perform 15-20 stretches. The kitten may cry but you have to persevere. Repeat the stretching sessions 5-10 times a day, the more often, the better. If the leg does not respond to the exercises or if the kitten is already walking before treatment is started and the leg cannot bear weight without collapsing, the twisted leg will need to be braced in the normal position. Bracing forces the leg into the correct position and supports it in that position while the tendons have the opportunity to grow normally. In the "olden days", popsicle sticks or tongue depressors were used to fashion a leg brace. The wooden stick is first cut to size. The leg and/or stick are padded with cotton batten. The stick is placed in position on the leg and everything is wrapped with gauze and secured with medical tape. While this type of brace still works, these "traditional" materials are no longer the best (or the easiest) choice for making a leg brace. "OLD SCHOOL" Bracing of a Hind Leg: Popsicle Sticks or tongue depressors, cotton padding, gauze and medical tape. Today, we have better materials to choose from to create a custom brace for a young kitten's leg. Some styles have Velcro tapes so the splint can be removed and re-applied to allow for physiotherapy to be performed on the leg. 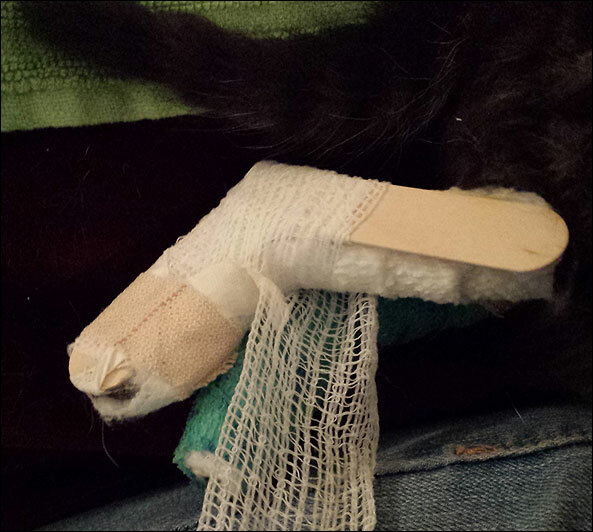 The other option for a brace, especially with very small kittens, is the handle from plastic cutlery such as from a fast food restaurant or a Dollar store. The plastic can be easily cut to size with scissors or a utility knife and then bent into shape by using the flame from a lighter to warm the plastic and then bending it at the point where the flame is applied. The resulting splint is very light with gently curved edges. The handle of a plastic spoon can be used with a larger kitten (left). The black areas are where the handle was heated up to bend it (right). By far the best product for holding a splint in place on the leg is Vet Wrap (also spelled Vetwrap or Vetrap). 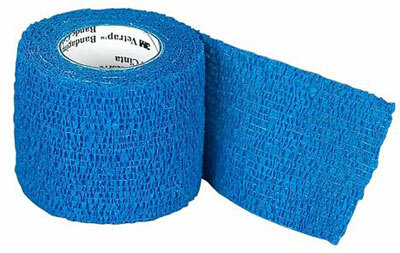 Vet Wrap is an inexpensive, self-adhering, slightly stretchy elastic bandage. It is reusable. Vet Wrap is available from your veterinarian, vet supply stores or online. Splints or braces must be monitored carefully for evidence of pressure sores or restricted circulation. 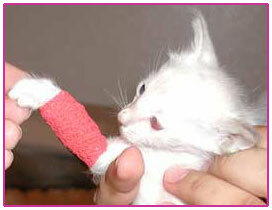 If you have wrapped the kitten's leg with the toes sticking out, check frequently to see if the foot begins to swell. Swelling means the bandage is restricting the circulation. Remove the splint, massage the leg to get the blood flowing normally, then reapply the wrap—a little looser this time. Bracing front legs is necessary if the twisted leg collapses when weight is put on it. The twisting on a front leg typically occurs at the kitten's "wrist" joint. Apply the brace from just above the paw to just below the elbow. It is important to leave the elbow free so that the kitten can move its leg easily. Bracing hind legs is a bit more complicated than front legs, but is required less often. Twisting on the hind leg occurs at the hock joint. Apply the brace covers from just above the paw to just below the stifle. A two-sided finger brace can be opened up to make a brace for the hind leg. Position the hock in the angle of the brace as shown in the photo on the right. If necessary, add more padding (cotton) on the front of the leg and tape it to keep the leg in place in the brace. Leave the stifle (knee) free to move if possible. Finish with Vet Wrap. If the kitten is splaying the hind legs out to the side, connect the legs to one another in a "hobble" by running a twist of tape or vet wrap between the two hind legs, leaving it long enough for the kitten to take a step but not so lose that it can splay the legs out sideways. The kitten should be able to stand upright and walk with the braces. Because the kitten is growing, the braces need to be redone every few days or they will get too tight. You may not be able to get his legs in a completely normal position at first—but brace them in as normal a position as possible—then remove the brace every day and do more stretching. Each day the leg should be able to be positioned a bit closer to normal. With multiple stretches daily and immediate bracing, you should have the twisted legs back into a normal position within a week. Continue bracing until the leg is strong enough to hold the weight of the kitten without collapsing. If the paw is not curled under, it does not need to be part of a brace. If the paw curls under, extend the brace and bend it to keep the paw in a normal position. It is important to try to get the twisted leg corrected before the kitten begins walking. 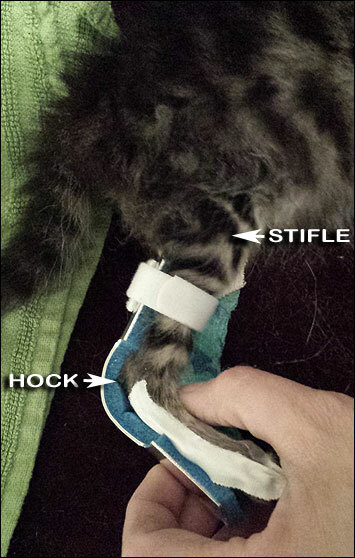 Bracing is optional before the kitten begins to walk depending on how severe the twisting may be. 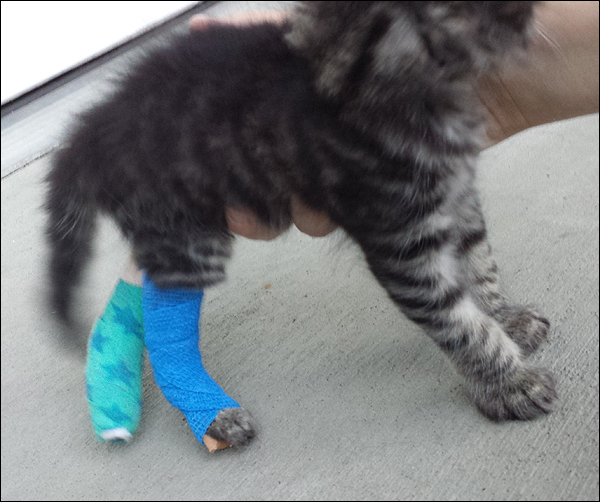 If the leg cannot support the kitten's weight once it begins to walk, the leg will HAVE TO BE BRACED. An older kitten with both hind legs in braces. Notice how the stifle is left free so the kitten is able to move its leg easily. Not all leg deformities are caused by contracted tendons.